Heat oven to 325°F. Spray shallow roasting pan with nonstick cooking spray. Place ham in sprayed pan. 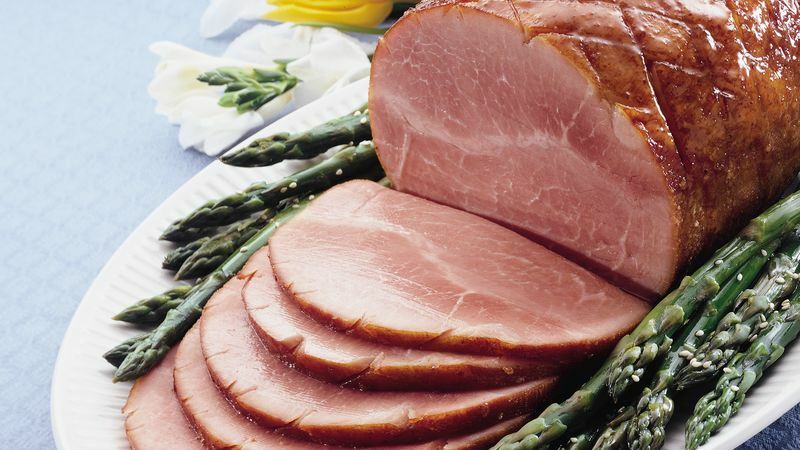 With knife, score ham by cutting diamond shapes about 1/4 inch deep through surface. Bake at 325°F. for 45 minutes. Meanwhile, in small saucepan, combine apple jelly, Dijon mustard, brown sugar, ginger and dry mustard. Cook over low heat until jelly is melted and mixture is well blended, stirring constantly. Remove ham from oven; brush with about half of the glaze. Return to oven; bake an additional 30 to 45 minutes or until ham is thoroughly heated, basting with remaining glaze once or twice. Serve with any remaining glaze.